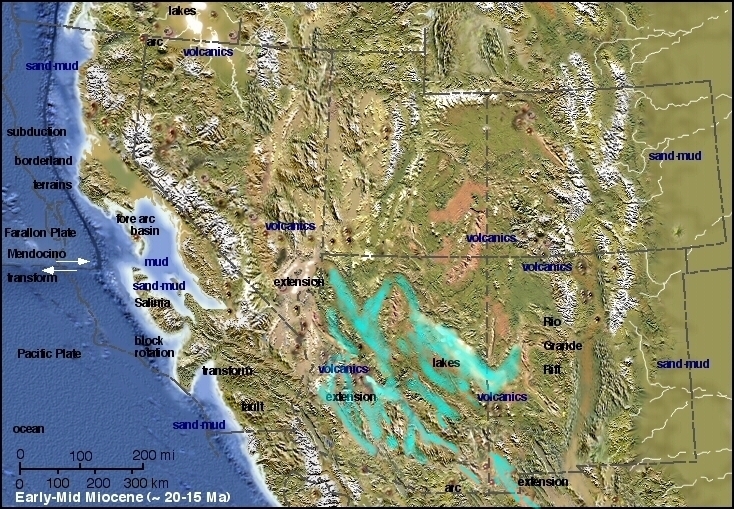 Occurring concurrently with the brine lakes was the active period of the Superstition volcanic field, which was comprised of many rhyolitic and dacitic volcanoes, calderas, and fissure eruptions. Some of the lakes engulfed a portion of the Superstition volcanic field, and eroded several of the volcanoes to their bases. 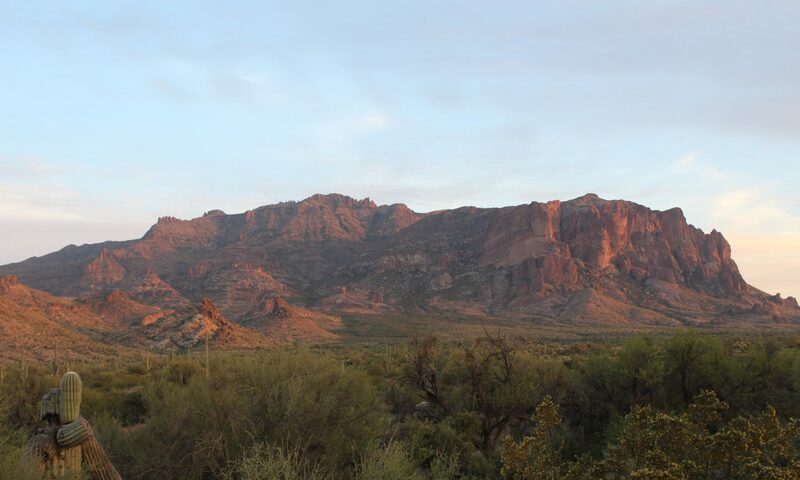 The Molly Marie Prospect is situated on what was once a submarine volcanic caldera of the Superstition field, which overprints a rhyolitic magma chamber over one mile in diameter. The brine from the lakes leached metals from the volcanic debris , arkosic breccias and arkosic sandstone that totaled over 3000 feet thick, once found above and near the Molly Marie Prospect. The metal-laden water boiled off above the magma chamber and created VMS (Volcanogenic Massive Sulfide) deposits below a layer of basalt that is currently exposed on the surface, and in abundant phreatic breccias. 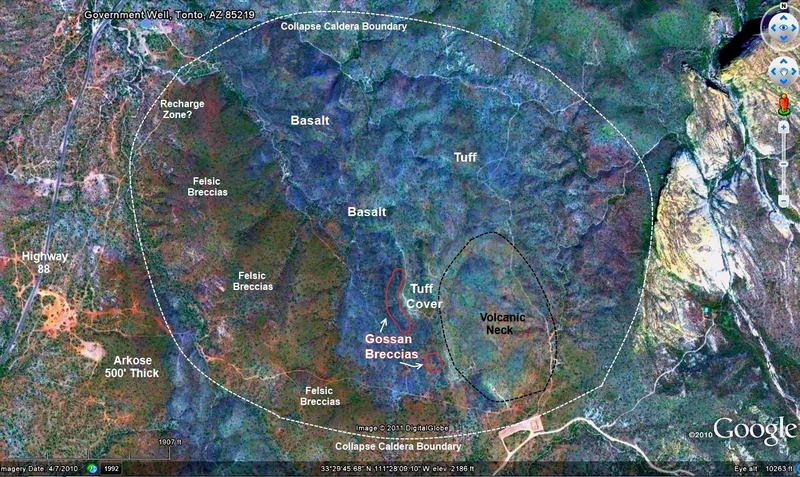 The Molly Marie caldera later collapsed over 700 feet, and within and on its perimeter are found abundant phreatic arkosic breccias, exhalites, gossan breccias, silica replacement, copper and gold mineralization, tufa deposits, intense propylitic alteration, and ring dikes. Near the center of the caldera is a rhyolitic porphyry stock complex,which is the neck of a strata volcano that has been eroded to its base. Surrounding the stock are diatremes, gossan breccias, and copper and gold mineralization. The enhanced photo below shows the boundary of the magma chamber, the volcanic neck, and the extensive felsic phreatic breccias on the west side of the caldera. The breccias will be discussed further in the ore genesis section. Below is a link to a great paper regarding gold-rich VMS gold deposits.